In the Land of the Rising Sun, a place far far away, powerful warriors prepare themselves for a battle in Hanzo’s Dojo. A Dojo is a special place created for fighters to come together and train and improve their skills in martial arts. Hanzo’s Dojo is set up in a serene area, surrounded by signature pink Japanese blossom trees and impressive statues. Four fighters remain inside the walls of the Dojo, each specialised in a type of martial art. The green character is a ninja, practising the art of ninjutsu. The blue character wears a fierce armor has he is a samurai. The orange character, by far the largest of the four fighters, tried to tackle his targets with sumo. The last remaining character is a lovely looking geisha. But don’t let her looks fool you as she takes down her enemies with her deadly fan skills. Together, these fighters make for a highly entertaining slot with some surprising features! Symbols are displayed inside the Dojo, which consists of five reels and three rows. In total the game has 25 paylines, which pay from the left to the right. There are eight regular win symbols. The four coloured icons are the symbols with the lowest value, and can yield up to 60 coins if you hit five of the red icons on one payline. It comes as no surprise that the four fighters are the four high win symbols. The lowest symbol is the ninja, which has a value between 20 and 160 coins. The highest fighter symbol is the sumo wrestler, which can create a win of 235 coins when five of them land on one payline. Besides the eight regular symbols the game also features a Wild. 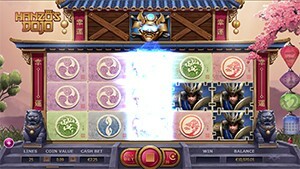 The regular Wild symbol can land anywhere on the reels during the base game and the free spins, and can substitute all regular symbols. So far the slot might seem pretty basic, but the fun is yet to begin! On top of the regular 5×3 set up, Hanzo’s Dojo features another 3 symbol positions. As it’s located on top of the Dojo, this area is aptly called the Rooftop slot. Each time you spin the reels, the symbols in the rooftop slot will also spins. There are three symbol outcomes for each position: the Expanding Wild symbol, the Hanzo symbol and the Blank symbol. The blank symbol doesn’t pay out anything. If the Expanding Wild symbol lands on any of the positions in the rooftop slot, it will expand down and cover all of the symbols on the row underneath with Wilds symbols. With a full row of Wilds, chances of a winning combination significantly increase. If the Rooftop slot is filled with 3 Hanzo symbols, then three Hanzo Spins will be activated. Before the Hanzo spins start, the Hanzo symbol will reveal a random regular symbol which will turn into a massive 3×3 symbol that will be locked in the middle of the reels during the Hanzo Spins. Ah Free Spins! Who doesn’t love them? Although this feature has been used in oh so many slots, Yggdrasil still managed to give them a slightly different “spin” in Hanzo’s Dojo. But let’s start at the beginning. How can you win free spins in this slot? The base game has two types of Free Spins symbols. One that has an arch and the number 3 (regular free spins), and one that has two dragons and the number 4 (rooftop free spins). The regular free spins symbols award 3 Free Spins per symbol, whilst the rooftop free spins symbols award 4 free spins + 1 Booster each. Wild 5th Reel – all symbols on the 5th reel will turn into Wilds. Once turned, they will remain Wilds till the end of the Free Spins. Whether you admire martial arts or not, Hanzo’s Dojo is a place where everyone entertain themselves. With a mini slot on top of the reels, Wilds and a Free Spins game with 5 boosters, Yggdrasil has once again delivered a top notch video slot! You can try out the slot for free at the top of this page. Feeling Lucky? Go to the recommend Yggdrasil Casino by clicking on the button and play the slot for real money. Have fun!